When the polynesians first discovered New Zealand 800 years ago, they named it the Land of Long White Cloud. The large cloud over the island became the beacon for them to aim for from the sea. When Sally and I drove around New Zealand for two weeks a few years ago, we found it to be the most pristine, unspoiled land we had ever seen. 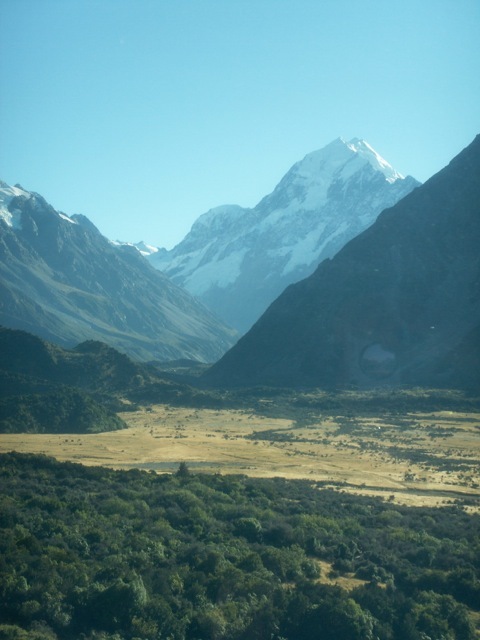 South Island, in particular, was sparsely populated, and the landscape was wide open. It was pure joy to be in such a beautiful land. 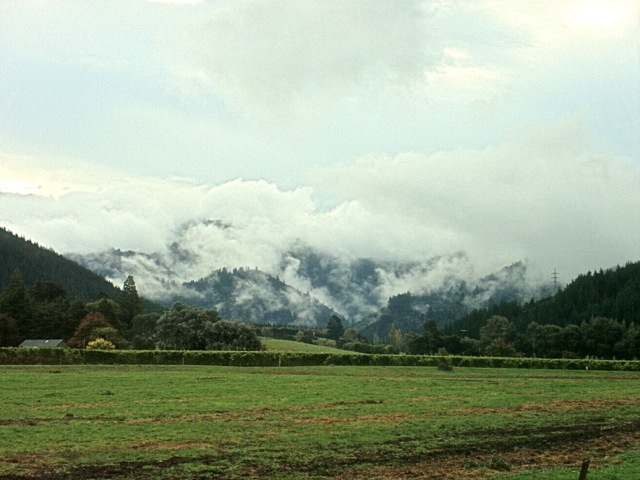 We saw this hill shrouded in ground fog one morning. 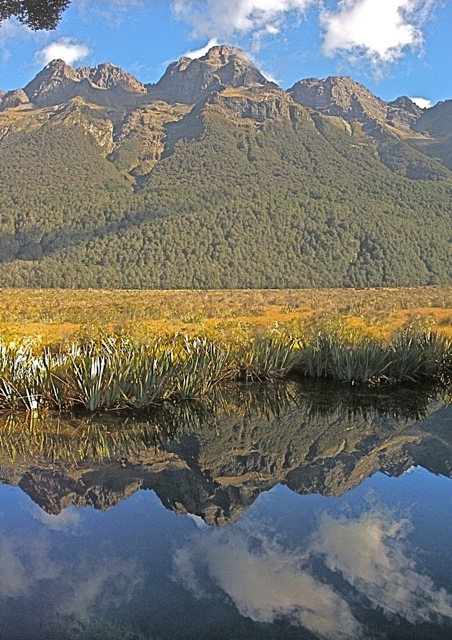 The distant mountain was perfectly reflected in the pond. 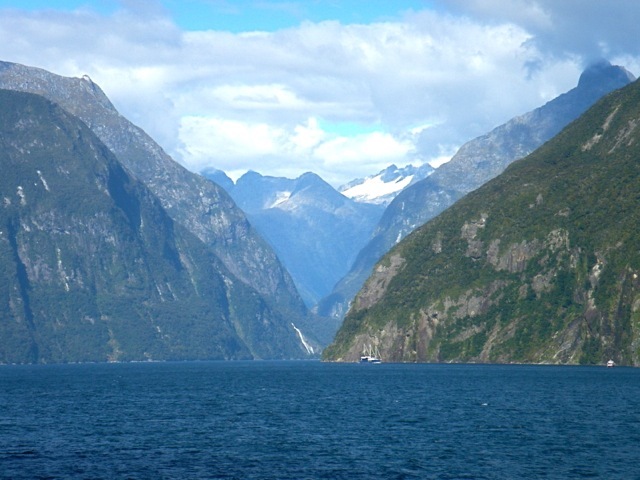 Milford Sound is a deep fjord with tall waterfalls cascading down the cliffs. This foggy shore was pounded by relentless surf. 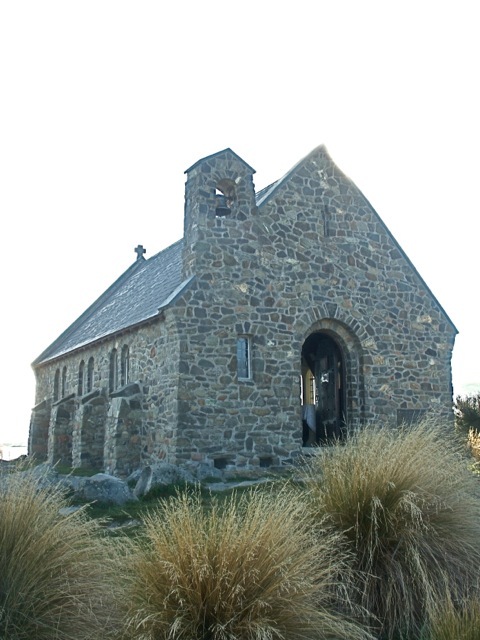 We found this small lonely stone church on the shore of a quiet lake. The altar of the church sat in front of a picture window. 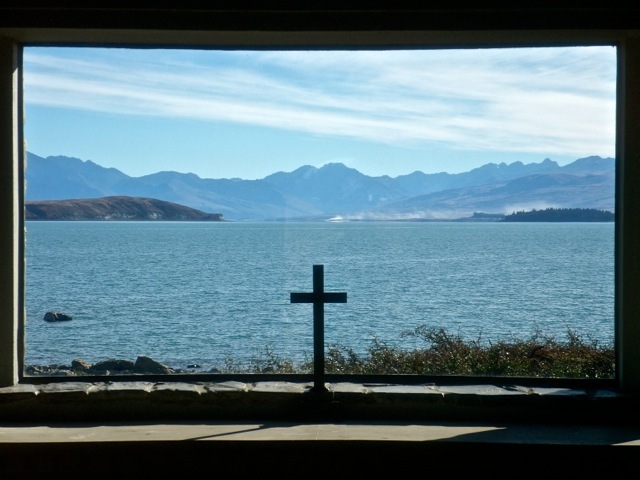 This wonderful view of the tranquil lake must have been inspiring to the church service attendees. 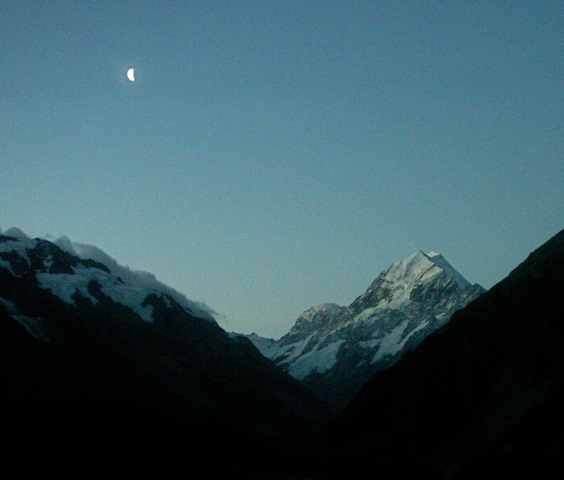 We stayed in a hotel overlooking the miles-wide valley that led to Mount Cook, the highest peak in New Zealand. 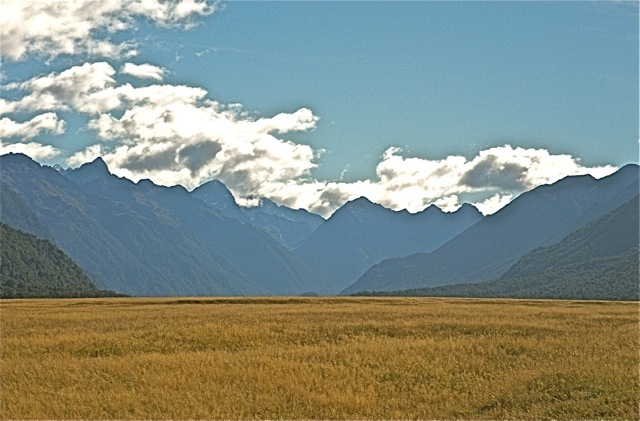 It is breathtaking landscapes like this that attracted the producer of the movie the Lord of the Rings to film in NZ. We could see the craggy rocks and snow fields of Mt. Cook. Through our room’s picture window, the peak appeared differently from sunset to moon-lit to sunrise. 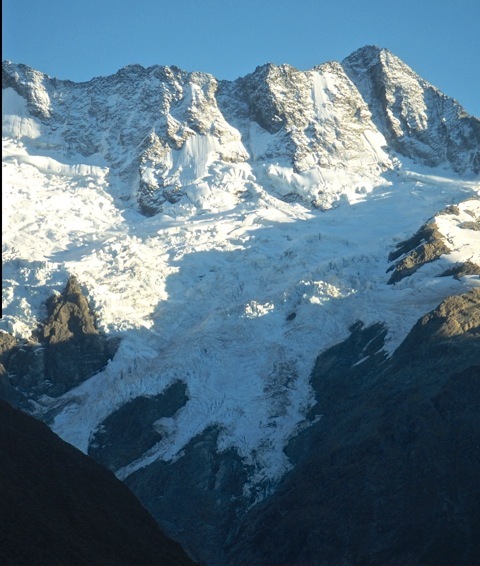 This run-off from glaciers was heavily laden with silt. 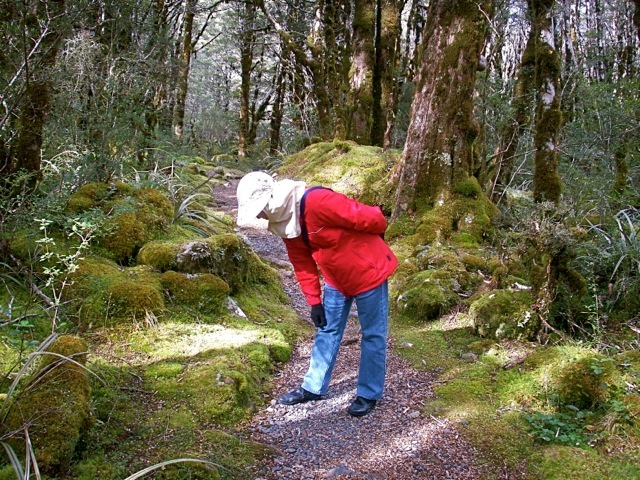 We strolled in fairy tale forests covered with kelly green moss and tiny flowers. 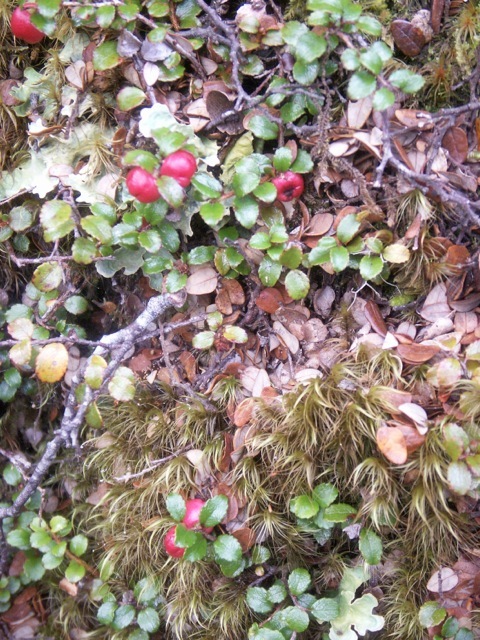 The forest floor was a palette of green, tan, brown and red. 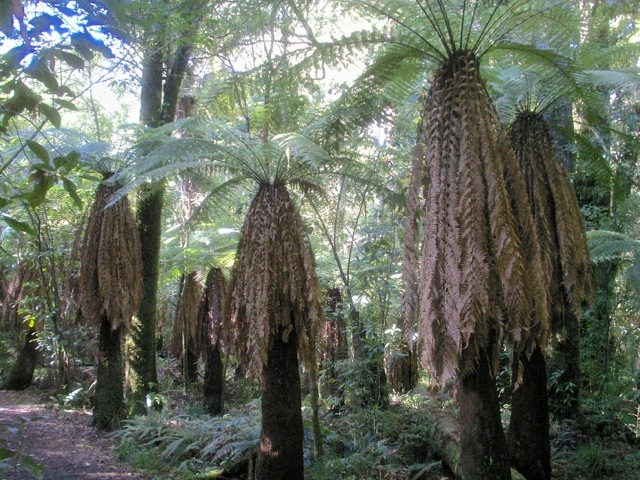 Dinosaurs fed on the ancestors of these tree ferns 100 million years ago. 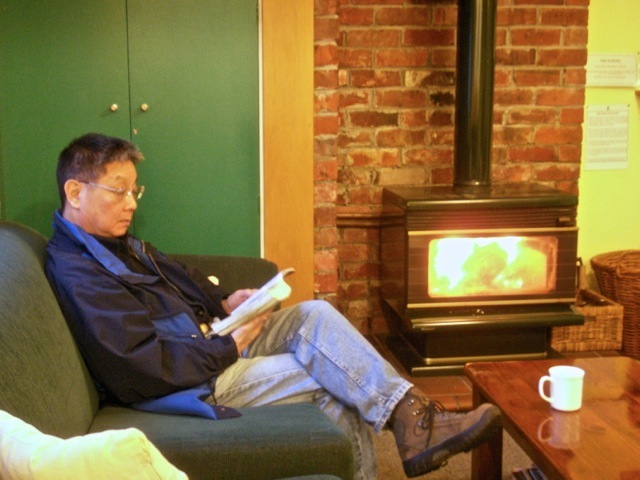 We stayed in B&Bs and they were clean, comfortable and inexpensive. 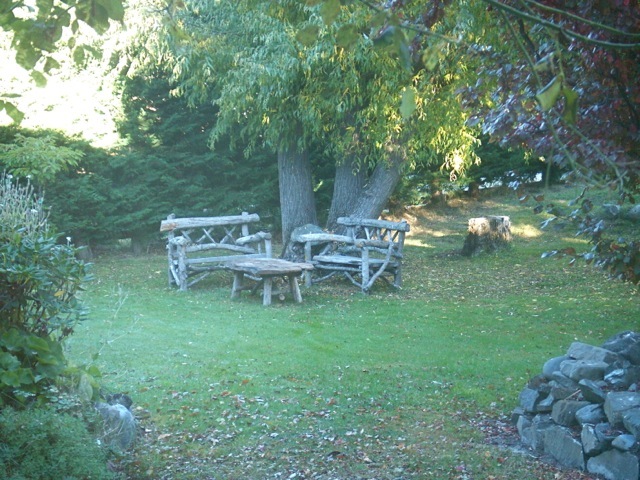 In this backyard of one B&B, I sipped my morning coffee sitting on these benches. We stayed in one inexpensive hostel. It was a small house with three bedrooms, a kitchen and a living room with a wood-burning fireplace. It was relaxing to enjoy this quiet house all by ourselves. We ate in a few restaurants that charged relatively high prices. Invariably, they disappointed us with poor cooking and/or ingredients that were not fresh. Surprisingly, we found some excellent foods in the most common places. 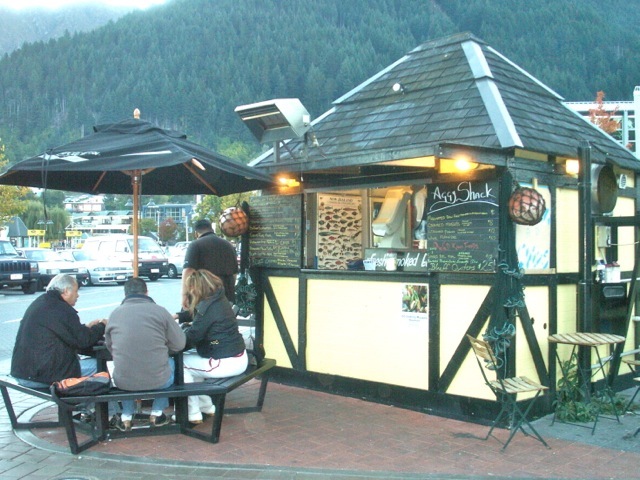 This tiny Aggy Shack on a sidewalk was so good we ate there three times in a row. 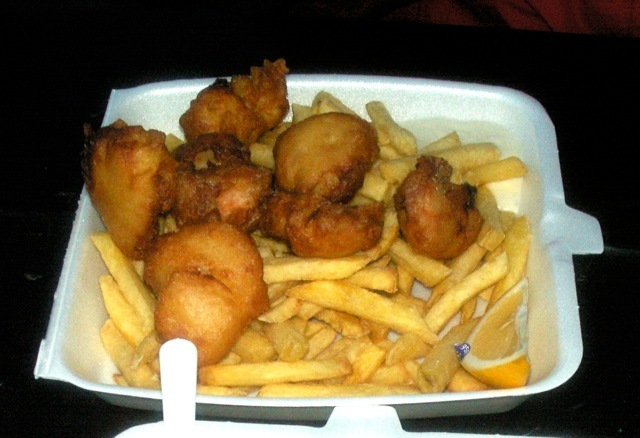 We enjoyed its fried scallops which were extremely fresh, tasty and inexpensive. 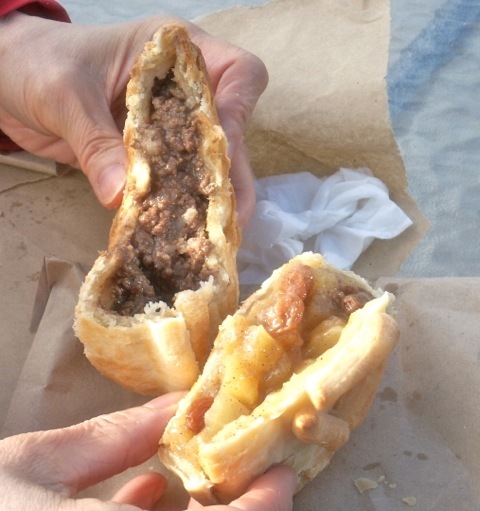 We bought these beef pie and apple pie from a storefront bakery. They were so delicious we tried every meat pie store we came across afterwards. Unfortunately, we never found pies as good as these again. The South Island has only 1/3 the population of North Island. Outside of its cities, the land is mostly empty country-side or cattle ranches with very few people. We drove on empty roads for hours and saw only one human for every few hundred animals. Once, I saw a few cattle in the distance wearing white blankets. “How considerate these owners are to cover their cattle with warm blankets”, I thought. 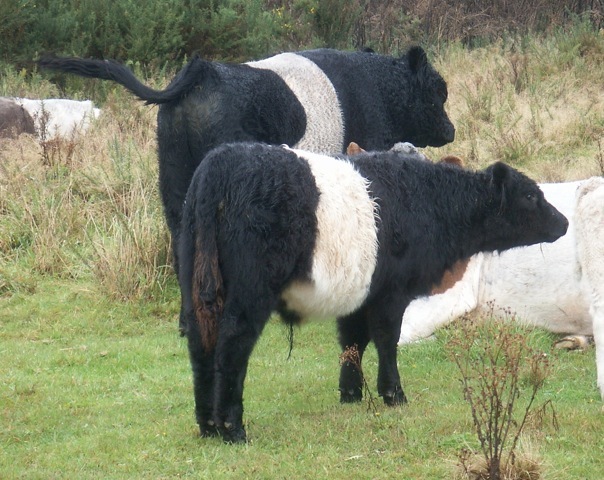 I doubled back and saw the blankets were just patches of white fur on otherwise black cattle. 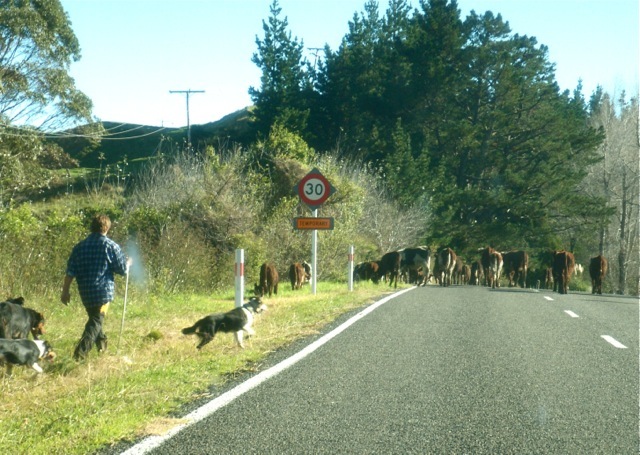 This cow herder, his border collies and grazing cattle were a rare sight on South Island roads. 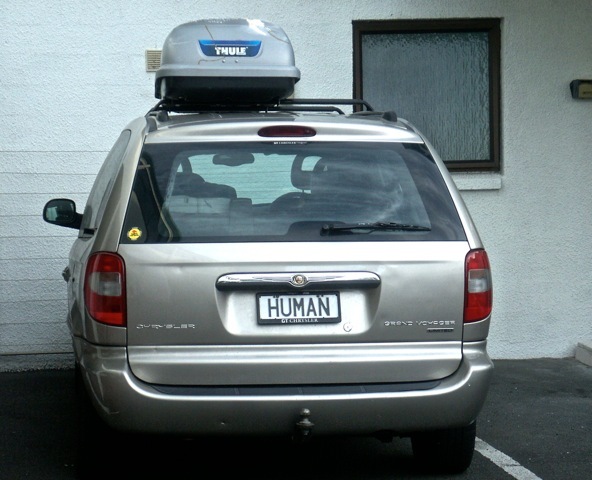 To distinguish himself from the numerous animals, this car’s owner identified himself as a bona fide human. 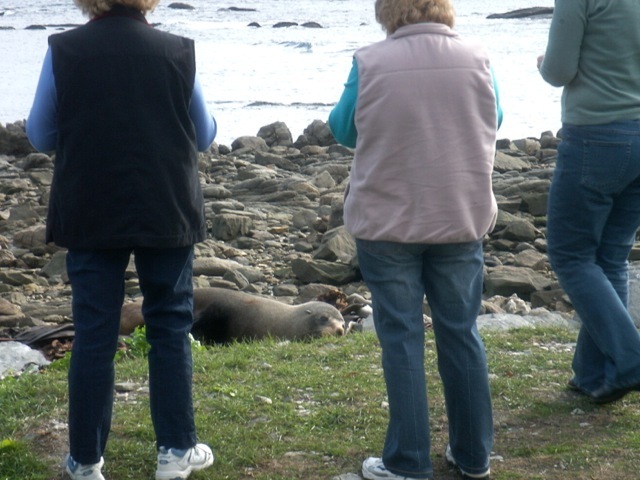 On one sea shore, tourists closed in on sunning seals. 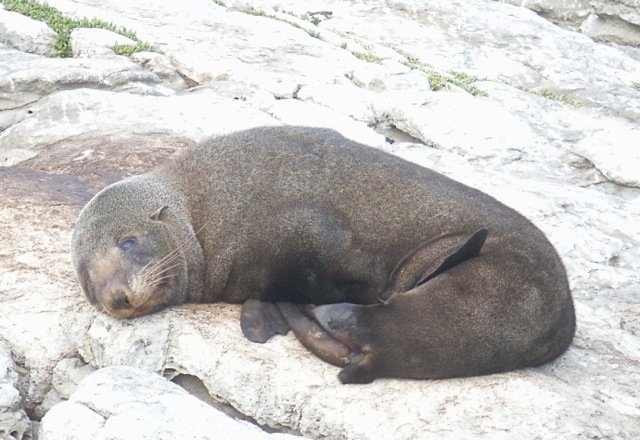 The seals were undisturbed by the human encroachment. They slept on contentedly. 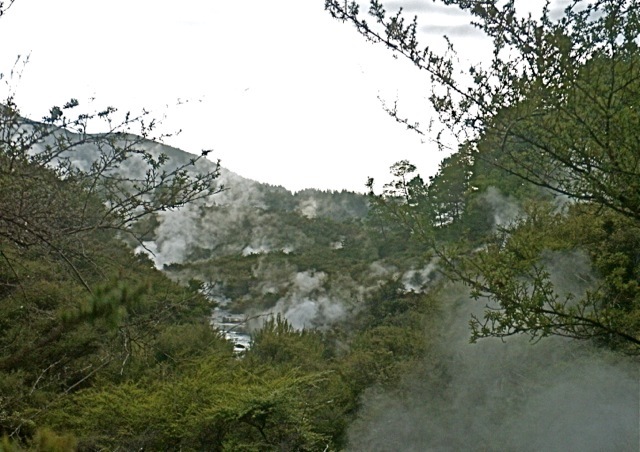 One of the few North Island sights that we enjoyed was the Rotorua geothermal region. Its large area of active thermal geysers and volcanic lakes was spectacular. 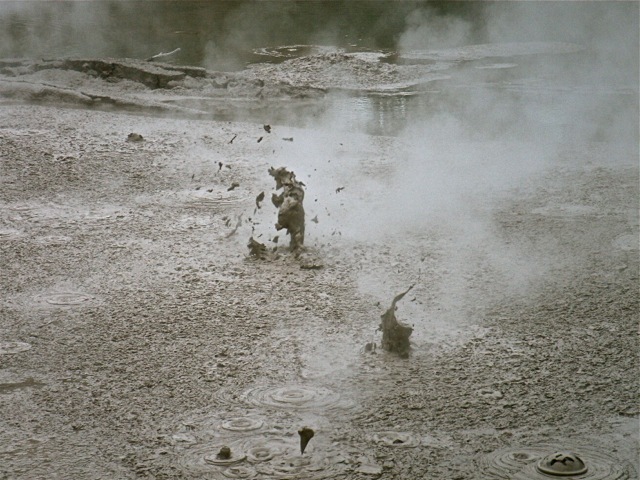 Steam poured out of volcanic features and covered hillsides with white vapor. Frightening geothermal pools gushed steam, hot mud, strangely colored water and leaping bubbles. Rororua ranks as one of the most forbidding places I have been to. 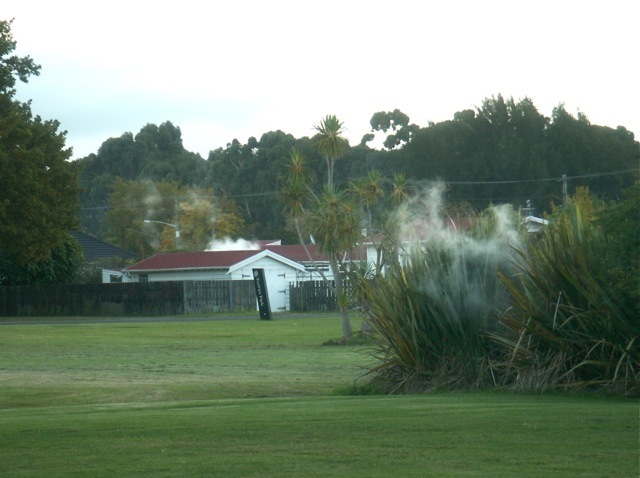 The city of Rotorua sits on top of vast geothermal activities. Residential backyards frequently have hot steam pouring out of steam vents. Some houses use the hot steam to heat their homes and swimming pools. 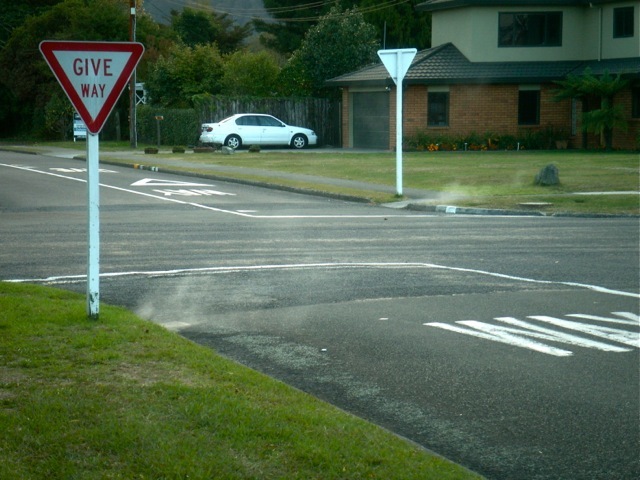 It feels strange to see steam rising out of street storm drains in Rotorua. In our two weeks of driving around New Zealand, we came to the conclusion that South Island was much more attractive than North Island. 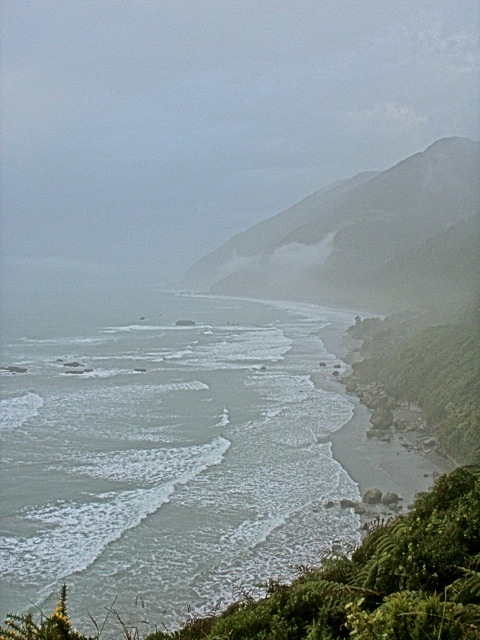 If we were to spend another ten days in New Zealand, nine would be spent on South Island. 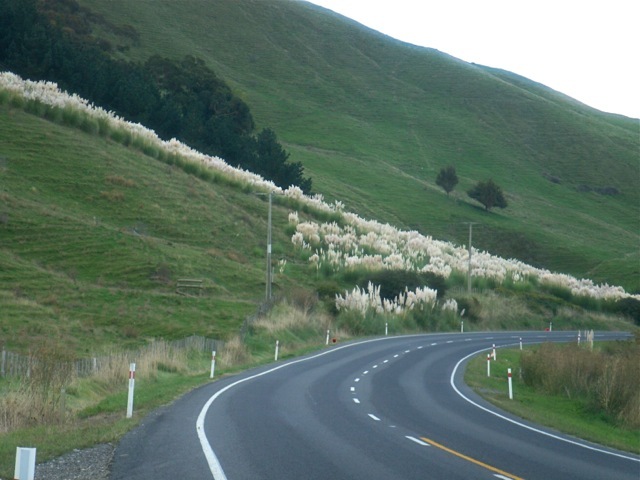 Our drive around New Zealand was most rewarding for the exposure to its natural beauty. To me, South Island is as close to paradise as I can ever get to. 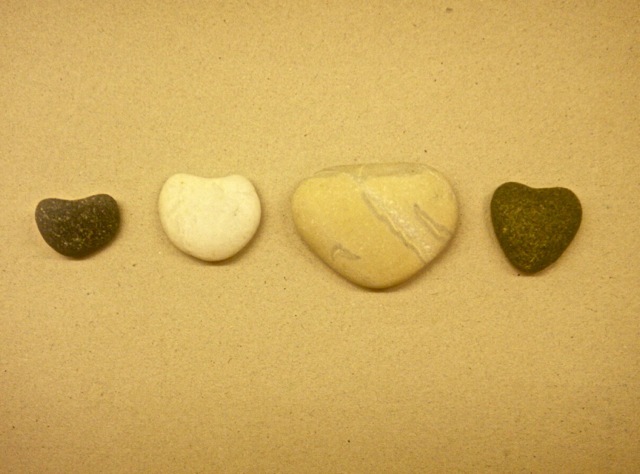 Furthermore, I found four heart-shaped stones to add to my collection. Posted by Robert Wu on Saturday, January 4, 2014, at 10:43 pm. Filed under Uncategorized. Follow any responses to this post with its comments RSS feed. You can post a comment or trackback from your blog.